This is my latest completed commission which was done for Nia who runs fashfoodista! Her blog is a lovely blend of food and fashion, and her features include outfits of the day, and awesome recipes! Her latest recipe is a warming casserole which is ideal for the frosty weather we have been having lately. This was such a fun and cute commission to design, and Nia was really kind and helpful with her suggestions. I particularly like the little cupcake! I would recommend checking out her blog! 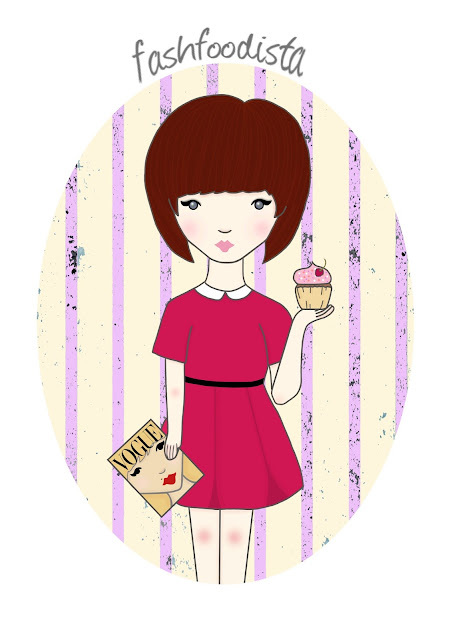 I love your style, this is perfect with the cupcake and the dress! You have so much talent! This is wonderful! This is so lovely, i bet she was pleased with it!